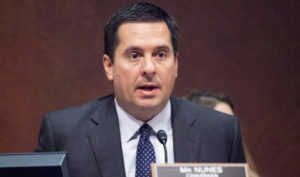 Rep. Devin Nunes is calling on a congressional task force to summon a group of Obama era officials, FBI agents and political activists to testify publicly about how they targeted the Donald Trump campaign in 2016. “If the House Oversight and Government Reform Committee and Judiciary Committee agree, their task force would conduct the most extensive probe to date on anti-Trump government operations in 2016,” Rowan Scarborough wrote in a July 7 report for The Washington Times. Nunes, who chairs the House Permanent Select Committee on Intelligence, has sent letters to Oversight chair Trey Gowdy of South Carolina and Judiciary’s Bob Goodlatte of Virginia with a list of 42 names including FBI, Justice Department and State Department officials and outside anti-Trump people with whom they communicated, the report said. Included on the California Republican’s list is FBI agent Peter Strzok, who in 2016 told his lover, former FBI lawyer Lisa Page that he planned to “stop” Trump. Page is also on the list. Ohr told the FBI that Steele was “desperate” to destroy the Trump candidacy via the unverified dossier. Also on Nunes’s list is Jonathan Winer, an aide to then-Secretary of State John Kerry, who “brought together Steele with Hillary Clinton operatives who had supposed dirt on Trump,” Scarborough wrote. Outside operatives on the list include Glenn Simpson, a co-founder of Fusion GPS who worked to get Steele’s dossier into the news media before election day. Hillary Clinton loyalists Sidney Blumenthal and Cody Shearer, “whose anti-Trump work found its way to Steele via Winer,” made the list as well, Scarborough noted. Also listed is Daniel Jones, a former top aide to Sen. Dianne Feinstein, California Democrat, on the Senate Select Committee on Intelligence. Jones founded his own investigative firm, Penn Quarter Group, and then hired Fusion GPS and Steele to continue investigating Trump after the election. Also on the list is Robby Mook, Clinton’s campaign manager and now a CNN analyst. In late July 2016, Mook “was one of the first Clinton people, if not the first, to finger Moscow as the hacker of Democratic computers to help candidate Trump. The U.S. intelligence community came to the same conclusion the following month,” Scarborough noted. Rep. Adam Schiff of California, the top Democrat on Nunes‘s committee, has fought the Republican’s inquiry into Obama officials, including finding out who paid for the dossier and how it was used. “Schiff was an early supporter of Steele’s work,” and “praised him openly and repeated his allegations,” Scarborough wrote.